I sit on the hard stool, waiting to be examined by the doctor, he looks at my chart on the computer screen. It is my first time there and I’m getting my throat checked at the doctor’s office in my building. I have to admit I will miss having an ENT doctor, dentist, dry cleaners, cafe, bakery, restaurants, 7-11, and more all in my apartment building when I move. He asks me in Korean, why don’t I have insurance. I try to explain that as a foreigner I have a separate int’l insurance, but he doesn’t seem to understand why I didn’t get Korean insurance. He tells me like he’s my parent, that I should get Korean insurance if I’m staying here long. Also, he says other Korean-Americans he knows get Korean insurance. I don’t feel like arguing so I just sit there an nod my head. He looks at me with eyes of disapproval. I just hope that he will do the check up. He pokes my nose and mouth with his instruments. Then, tells me that he will prescribe me medicine that might make me sleepy. After a few minutes, I’m escorted to the side where there are two machines. The assistant tells me to put the tube like thing into my nose and press the red button to start it. I need to do it for 60 seconds in both nostrils. I obediently follow the directions and go to the front desk when I’m finished. 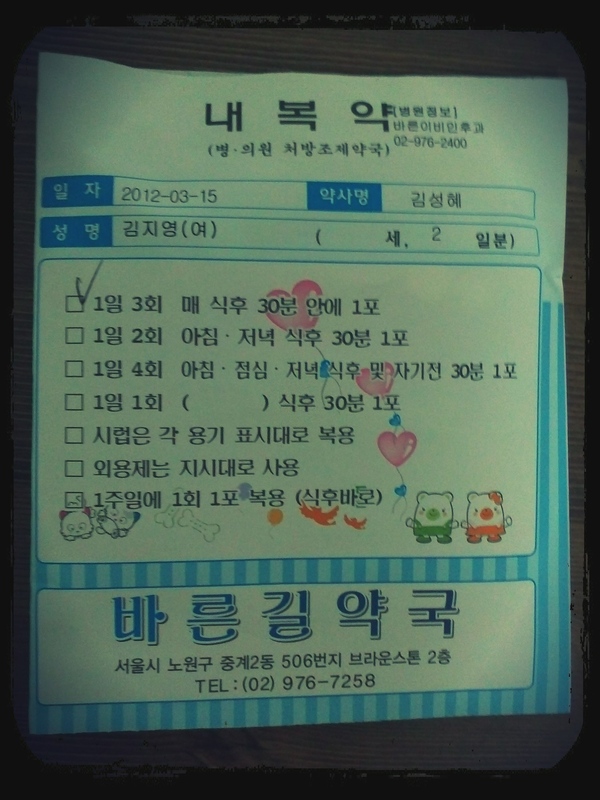 I receive my prescription and my bill. About $11 for the check up, and that with’s no insurance. I go to the pharmacy next door and a few minutes later I receive my bag of medicine. It costs $11 as well, again with no insurance. So there it is. 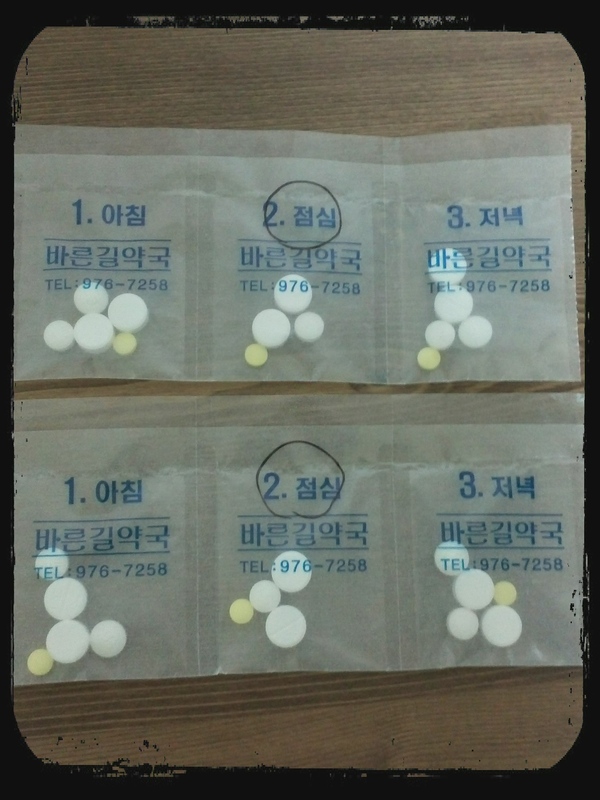 A typical experience of going to the doctor in Korea. 10 minutes to see the doctor (no appointment made). 3 minutes to get the prescription right next door. I take the elevator and I’m in my apartment. I love Korea. Who doesn't want cute hearts and pigs on their prescription bag?! Only in Korea! Pretty packaged pills. They separate them by which ones you should take after each meal. Definitely a different experience than US medicine! I enjoyed learning about it…and I hope you feel better! My post yesterday was about my doctor’s appointment: set four months in advance, waited forty-five minutes after my appointed time to see the doctor. $35 co-pay. Have to pick up prescription at the end of the day because it was electronically called in. $20 for two meds with insurance and pharmacy card. Definitely not Korea! Yes..such a big difference in terms of cost and time for going to the doctors in America~! I have to know. What was the thing you put in your nose??? Wow – just seems to easy! And it’s all right in your apartment building??? No waiting, not lines, $11 checkup, cute hearts and separated pills? After all that, you just had to slip upstairs and rest. Perfect! Hope you are feeling better!!! Why does it have to be so hard to go to a doctor here? You are so lucky, I wonder what it will be like in Singapore. I love it when you give us a glimpse into another culture with a common activity. I, too, like hearing about another part of the world and how something we all do, or at least try to do, happens in a uniquely Korean way. I loved your descriptions of the your conversation with the doctor. A very interesting slice of your life there. I hope you are feeling better. Living overseas certainly makes you look at the price of medical care in the U.S. from a different perspective. The convenience of all of that in your building is fabulous!